Google exactly knows what memory means to human beings and it’s all decked up in improving the Photos App. Since the announcement of the pulling off of Picasa, Google is ameliorating Google Photos app to a great extent. The latest update is for iOS users. Google Photos will now support automatic photo backup and Live Photo viewing on iPhone 6S and iPhone 6S Plus. The company is now performing really well on the Photos application and it has garnered over 100 million patrons in less than a year. So it’s time to slowly shift to Google Photos as it saves your tiny winy 5 GB or iCloud storage from getting stuffed. 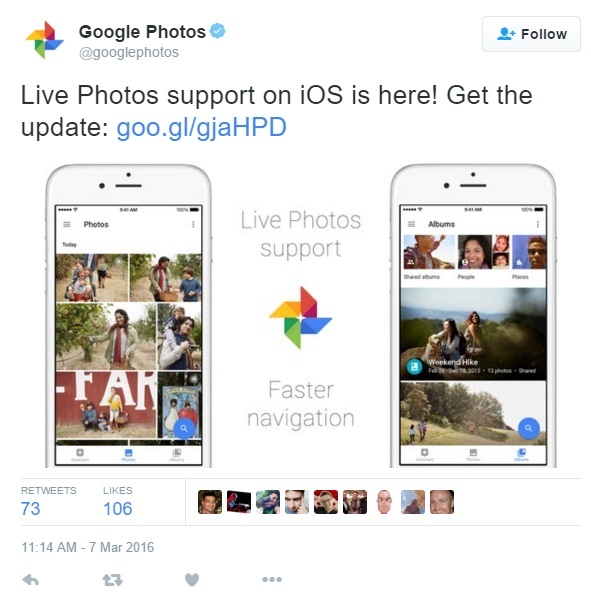 The update has come from Google Photos when it tweeted that Live Photos support is on for iPhone 6S and iPhone 6S plus. The images will be tagged with the Live Photo icon at the top of the screen. This icon will let you know that it’s not just a static image. Now if you download the Live Photo from Google Photos back to your iPhone, then the Live Photo will not remain animated. Again, if you save a backed-up Live Photo to the Camera Roll, then the animated photos should play. This feature is retroactive and Google has confirmed that Live Photos captured before the update are now synced and appear as Live Photos on Google Photos app. If you always have a nightmare of having shortage of storage on your iPhones due to the overwhelming selfies and trip snaps, then it’s the best time to have a glance at Google.